Pinnacle Airlines’ highly anticipated entrance into Chapter 11 bankruptcy protestion reflects challenges regional airlines in the US face in finding ways to achieve sustained profitability. Delta’s decision to become Pinnacle’s benefactor also shows the complexity of the intertwined relationships between regionals and their mainline partners that foster an unhealthy interdependency. Pinnacle CEO Sean Menke has been flagging up the possibility of a formal restructuring of the company since late last year when the carrier embarked on an extensive cost-cutting scheme by attempting to gain concessions from employees, restructure supplier contracts and negotiate changes to some of the capacity purchase agreements it has with its major partners to make those deals profitable. Pinnacle’s management discontinued negotiations with all labour groups after it failed to reach an agreement with the Air Line Pilots Association. Temporary relief the carrier obtained from partner United in the form of increased payments expired on 01-Apr-2012, the same day Pinnacle filed for Chapter 11. Pinnacle had been negotiating with United to restructure the agreement covering the operation of 31 Bombardier Q400 turboprops by its subsidiary Colgan to make the flying profitable. But ultimately the negotiations failed, and Pinnacle plans to exit its Q400 operations for United by 30-Nov-2012. Pro-rate Saab 340 flying Colgan performs for United is expected to end in Jul-2012. Under pro-rate agreements regional carriers assume more risk and expense, including fuel costs. As those negotiations remained fruitless, Pinnacle’s management calculated the carrier’s cash balance would dwindle quickly from the USD45 million it had at the time it filed for Chapter 11, and determined the carrier might run out of money by mid Apr-2012. From the end of Sep-2011 through 01-Apr-2012, Pinnacle’s cash balances fell by USD37 million. Now Delta has stepped forward to supply its regional partner with USD74.3 million of debtor in possession (DIP) financing, of which USD44.3 million will be used to pay-off a USD62 million loan Delta made to Pinnacle in 2010 that allowed Pinnacle to purchase Delta’s wholly-owned regional subsidiary Mesaba. Delta has agreed to turn the remaining USD30 million into a five-year exit facility. Pinnacle worked with Barclays in 2011 to find sources of liquidity with three sources emerging with term sheets for USD40 million in capital, but in order to access the funding Pinnacle needed to secure concessionary deals with its labour groups and major airline partners. The search then transitioned to looking for potential lenders for debtor-in-possession financing, but Pinnacle in court documents explained that most of the potential providers were off-put by its lack of collateral. Ultimately, it was only Delta which emerged to bailout its regional partner. Pinnacle explains it would have been difficult to navigate receiving DIP financing from a third party since Delta would have the right to gain approval from the bankruptcy court to offset payments it would owe to Pinnacle for pre-petition operations against pre-petition amounts that Pinnacle owes Delta for the loan used to buy Mesaba and other payments. “Given the risk and uncertainty that a third-party DIP lender would face in connection with Delta’s potential assertion of large set-off claims and the costs and delay that could results from litigation of such claims, a third-party DIP lender would need to provide approximately USD10 million more financing than a comparable DIP from Delta to account for the potential liquidity shortfall such a set-off could cause,” Pinnacle explained in a court filing. Initial negotiations between Delta and Pinnacle covering DIP financing began in Jan-2012 but ended when the two carriers failed to agree on the amount of funding and pricing. Talks that eventually led to the negotiated settlement began in Mar-2012. In a statement to the bankruptcy court, Mr Menke declared that at the conclusion of negotiations, “neither party got everything they sought, but each party determined that it received sufficient benefits from the overall package agreement”. The fits and starts of the Pinnacle-Delta negotiations show the begrudging nature of the relationships between regional carriers and their mainline partners. Delta had little choice but to offer Pinnacle financing to ensure that roughly 200 aircraft would not suddenly disappear from its operations. Pinnacle is Delta’s second largest partner behind SkyWest. Pinnacle agreed to waive certain reset rights that would have included higher rates to cover increasing pilot costs in agreements covering the operation of 142 Bombardier CRJ200s and 41 CRJ900s. The carrier also agreed to a modified margin covering the CRJ200 operations. Pinnacle determined the CRJ200s it operates on behalf of Delta produce profits. The carrier bears no ownership costs on those aircraft since it leases the small jets from Delta. 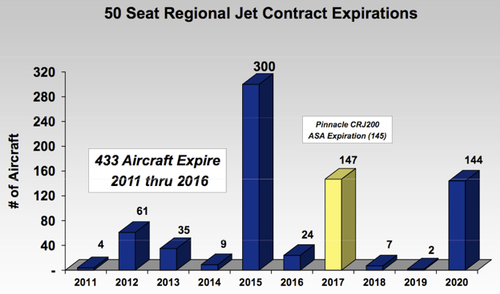 Delta has agreed to extend Pinnacle’s CRJ200 contract by four and a half years, which means it will be saddled with 145 50-seaters that it takes great pains to declare are uneconomical until 2022. Delta does have the right to file an unsecured claim for damages related to an early termination of the operation of the 16 CRJ900s that will span five months beginning in Jan-2013. Pinnacle had been attempting to rework that particular contract after Mr Menke, who took the helm at the carrier in Jun-2011, concluded the agreement was producing marginal economics for Pinnacle. Export Development Canada (EDC) holds the two largest secured claims against Pinnacle totalling roughly USD690 million covering loan agreements for 28 of Pinnacle’s Q400 aircraft and the 16 CRJ900s. Pinnacle stated as its Q400s are removed from service they will be abandoned to EDC, in exchange for the agency waiving any administrative claims and limiting its deficiency claim on the aircraft and “United’s providing certain cash and other consideration”. The previous executive team at Pinnacle devised a strategy in 2007 to make the larger 70-seat Q400 a staple in its future growth platform, and the purchase of Colgan Air gave Pinnacle the means to execute its plan. Pinnacle’s 2010 purchase of Mesaba was devised to enlarge its 70-plus seat CRJ900 operations and position the carrier to capitalise on the operation of larger-capacity aircraft that its mainline partners desired. But now it is willing to relinquish 28% of its CRJ900 fleet as the original agreement it brokered with Delta for the operation of the aircraft could not produce strong enough returns to cover the ownership costs. Perhaps Pinnacle underestimated the ease with which it could integrate Mesaba’s operations, and indicated to the bankruptcy courts that it has lost revenue in the tens of millions of dollars largely from delays in moving Mesaba’s jet operations to the Pinnacle operating certificate, which occurred on target in May-2011. But delays in getting necessary approvals from the FAA pushed back the transition until Jan-2012. Pinnacle also saw increasing cost pressure from an agreement it reached in Feb-2011 covering pilots at its three airline subsidiaries: Colgan, Mesaba and Pinnacle. Once Mr Menke took over as CEO and completed his due diligence, Pinnacle’s management team determined that the pilot compensation was above market rates. The company also incurred unplanned training costs as pilots of all three airlines were able to move freely to bid on vacancies across all the carriers, which also disrupted operations and increased expenses. In Nov-2011, Pinnacle estimated a USD19 million increase in pilot costs for that year. Pinnacle’s fellow regional carrier SkyWest Airlines has encountered its own problems in integrating ExpressJet into the operations of its subsidiary Atlantic Southeast Airlines, and has publicly admitted its expectations in executing a seamless merger were too high. Integration challenges pushed SkyWest into the red in 2011 for the first time in 23 years as the carrier lost USD27.3 million. Struggles by both SkyWest and Pinnacle in their integration efforts show consolidation in the US regional industry has done little to create any sense of stability in the sector. The acquisition of Mesaba by Pinnacle that was engineered to give the company firm footing in a highly uncertain operating environment for US regional airlines ultimately drove the company into Chapter 11. Pinnacle’s attempt at diversifying its partner base through its deal with United has vaporised as that deal comes to and by the close of 2012. 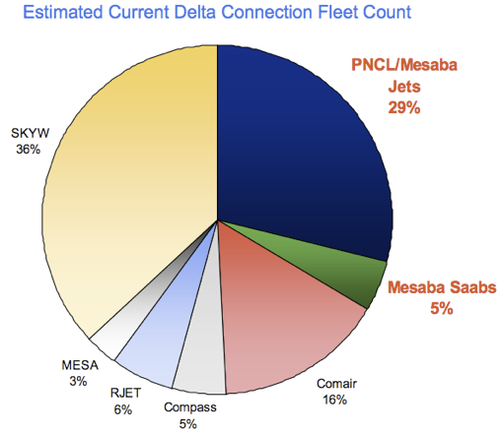 What remains is a not a mutually beneficial relationship between Pinnacle and Delta but a partnership borne of necessity that allows Delta minimal disruption to its operations and balance sheet and puts Pinnacle in the exact position it was in five years ago: a regional operator that operated a large fleet of undesirable 50-seat jets and who had a single partner.